Kyle Grillot - kgrillot@shawmedia.com Customers purchase strawberries from Van Laar's Fruit Farm at the Woodstock Farmers Market Tuesday, June 24, 2014. Gov. Pat Quinn signed a bill into law Saturday that creates a uniform set of health rules statewide for farmers' markets. 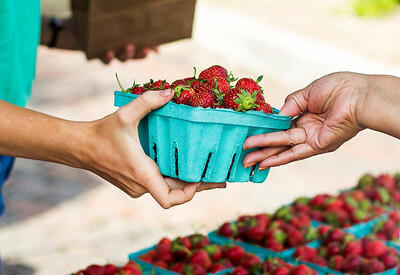 House Bill 5657, sponsored by State Representative Michael Tryon (R-Crystal Lake) and State Senator David Koehler (D-Peoria), requires vendors to inform consumers of the origin of agricultural products and caps the amount health departments can charge for monitoring farmers markets at $25. Kyle Grillot - kgrillot@shawmedia.com Arianne Albright of Crystal Lake (right), inspects radishes before buying them from Troy Edmonds of Edmonds Acres at the Woodstock Farmers Market Tuesday, June 24, 2014. Gov. Pat Quinn signed a bill into law Saturday that creates a uniform set of health rules statewide for farmers' markets. 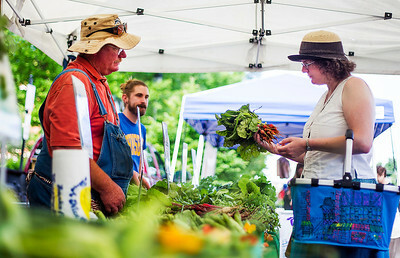 House Bill 5657, sponsored by State Representative Michael Tryon (R-Crystal Lake) and State Senator David Koehler (D-Peoria), requires vendors to inform consumers of the origin of agricultural products and caps the amount health departments can charge for monitoring farmers markets at $25.